Alex thinks I need to break myself of the habit of photographing this green coral. He thinks, quite reasonably, that you should spend your scarce underwater time on promising subjects. 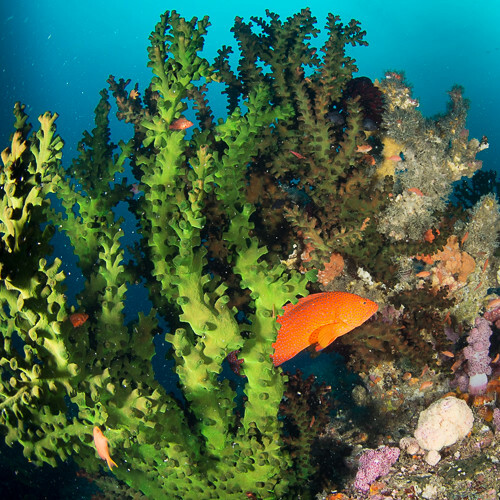 And the problem with that green coral, no matter how pretty you think it is, is that it is really dark. It just eats light. And that means it’s hard to get a good shot. And you have to turn your strobes way up increasing your backscatter problems. You can see my backscatter problems on the left side. And often the coral is even darker than this which makes it even harder. Ok, well fine. But I still really like it. And when I saw the nice orange snapper, I couldn’t resist.